With a ding at the White House’s “humiliated” response, Sen. Rand Paul says he finally has the answer to the question that launched his marathon filibuster Wednesday on the Senate floor. “Hoo-ray,” the Kentucky Republican said upon being read a brief letter of response from Attorney General Eric Holder during an appearance on FOX News. Paul led the nearly 13-hour filibuster in protest of what he called the Obama administration's lack of clarity about whether or not a U.S. citizen could be targeted by a drone attack on American soil. Holder's letter reads: "It has come to my attention that you have now asked an additional question: 'Does the President have the authority to use a weaponized drone to kill an American not engaged in combat on American soil.' The answer to that question is no." 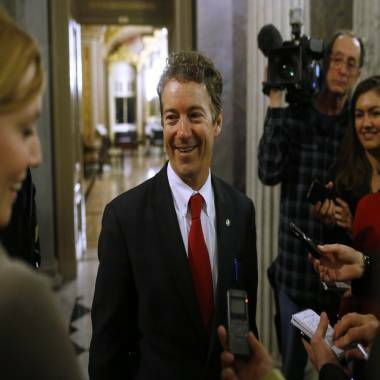 Sen. Rand Paul, R-Ky., leaves the floor of the Senate after his filibuster of the nomination of John Brennan to be CIA director on Capitol Hill in Washington, early Thursday, March 7, 2013. In a written statement issued later Thursday, Paul said that response guarantees "basic" rights of Americans. "This is a major victory for American civil liberties and ensures the protection of our basic Constitutional rights. We have Separation of Powers to protect our rights," he said. "That's what government was organized to do and that's what the Constitution was put in place to do." After holding forth on the Senate floor for almost 13 hours last night, Paul said that the curt letter from the Department of Justice sufficiently answered the question that fueled his Mr. Smith-style speechifying yesterday, which won him fans from Glenn Beck to Code Pink. With the lengthy filibuster in the books, Paul had threatened to continue to hold up the nomination of CIA director John Brennan until Saturday morning if he didn’t receive an answer from the Obama administration. “We’re using the leverage of holding up the vote,” he said on Beck’s show Thursday morning.. "And I can keep [the Senate] here through Saturday and they hate to work on weekends." Brennan's nomination is now headed for a vote this afternoon.